A CWPP is a local wildfire protection plan that can take a variety of forms based on the needs of the community. The CWPP may address issues such as wildfire response, hazard mitigation, community preparedness, training, equipment or structure protection - or all of the above. The process of developing a CWPP can help a community clarify and refine its priorities for protection of life, property and critical infrastructure in the wildland-urban interface. It can also lead community members through valuable discussions regarding management options and implications for the surrounding watershed. CWPPs improve a community's ability to compete for grants to fund hazard mitigation projects, prevention, and preparedness education for residents in the community. DAKOTA HIDEOUT covers 6,759 acres within 168 land parcels. Subdivisions included are the Dakota Hideout landowners on the eastern side of Canon City. GARDEN PARK covers 37,319 acres, 4 subdivisions with 65 lots, 74 parcels of private lands, and, total structures of 148. Subdivisions included are Dilley Ranch North and South, Cooper Mountain, and Cliffside Heights. SOUTHWEST CANON covers 12,340 acres, 3 subdivisions, and 841 total structures. Subdivisions included are Dawson Ranch, Wolf Park, and Eagle Heights. Private landowners included are on County Roads 3 and 143 down to Prospect Heights. UPPER BEAVER CREEK covers 18,903 acres within 157 land parcels. Private landowners included are on County Road 132. For more information on the local Community Wildfire Protection Plans, please visit the Fremont County website at www.fremontco.com, under the Emergency Management Department. - The first concern is the risk to people trying to evacuate under less that optimal conditions. - Second is the risk to firefighters attempting to protect property. - Third is the risk wildfire poses to property. The concept of survivable space addresses both the second and third facets of risk under one umbrella. Survivable space is an area around the structures where fuels and vegetation are treated, cleared or reduced to slow the spread of wildfire towards the structure and lower the intensity of the fire as it passes the developed area. Survivable space around a structure is the key to assuring the home is still standing after a major wildfire event. A structure is survivable IF it can withstand being overrun by a high intensity wildfire without any on site intervention by wildfire personnel. For more information on Survivable Space see http://www.fws.gov/mountain-prairie/fire/guides/Living_With_Fire/. 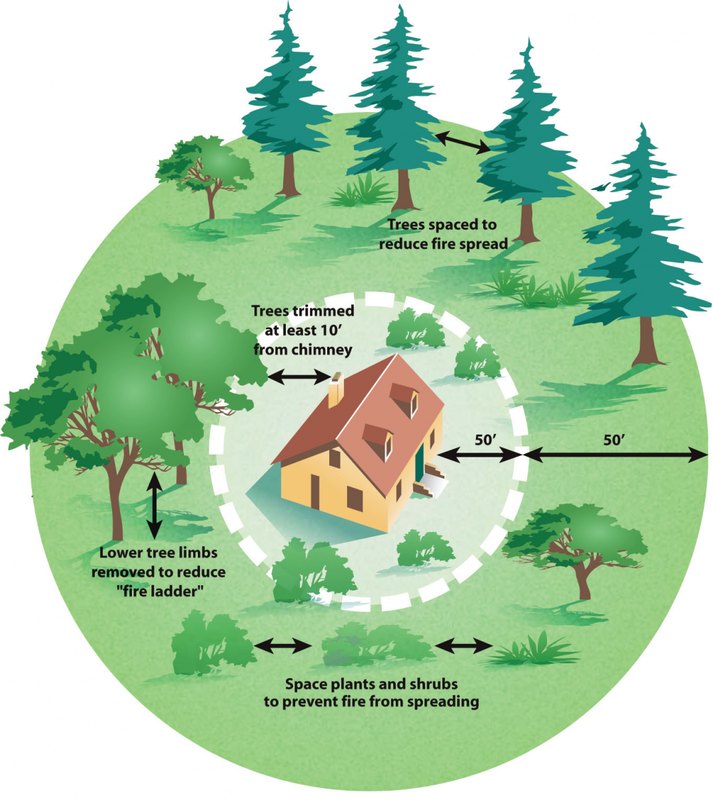 The concept of Defensible space assumes that there will be sufficient wildfire personnel and equipment to actively protect each threatened structure. This assumption is accurate when only one or two structures are imperiled. When numerous structures are threatened there aren't enough firefighting resources available to protect them all. For more information on Defensible Space see www.csfs.colostate.edu. One of the best ways to improve community wildfire resilience is wildfire awareness activities such as brochures, public service announcements, workshops and informal discussions in the neighborhood. Fremont County has a FireWise Trailer that is taken to various gatherings in the County. It contains materials and displays that speak to the benefits of FireWise behavior. To request the FireWise Trailer in your neighborhood, call the Fremont County Office of Emergency Management at 719-276-7422. Defensible space around a structure is one way that a landowner can help protect their homes and property. There is also a tax incentive for wildfire hazard mitigation for up to $2500 on taxable income. The program allows each landowner to get credit for fifty percent of the cost of wildfire mitigation up to a total of $2500. To get the full credit the total mitigation costs be $5000 or greater. The work must be done in accord with an existing Community Wildfire Protection Plan to qualify. The deductions for this incentive have been extended until January 1, 2025 to encourage more residents of the Wildland Urban Interface to mitigate wildfire hazards around their homes. See House Bill 13-1012.